A sonic “experience”: Florent Schmitt’s Psalm 47. For many classical music lovers, nothing can compare to a live performance. While studio recordings promise greater precision and better sound quality — along with avoiding distracting audience noise – often this comes at the expense of spontaneity and immediacy. And for a piece of music as viscerally thrilling as Florent Schmitt’s Psalm XLVII, Op. 38, composed in 1904, the excitement is even more exhilarating in a live performance. But concert performances of this music are still quite rare. Fortunately for us, the full measure of excitement is captured in six live recordings of this music that are currently available on CD or via high-res download. Even better, they’re directed by some of classical music’s great conductors: Désiré Inghelbrecht, Jean Martinon, Eugene Ormandy, Jean Fournet and Leon Botstein. 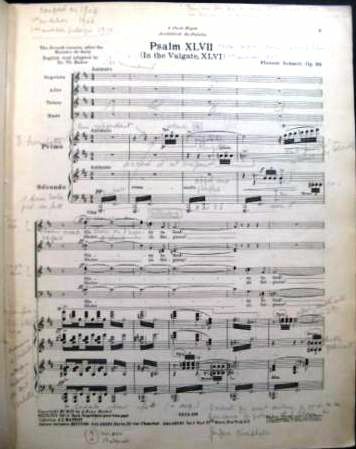 The first page from a vintage copy of the piano-reduction version of Florent Schmitt’s Psaume XLVII, with copious notes written in by an unknown music director. Désiré Inghelbrecht gave the premiere performance of Florent Schmitt’s Psaume XLVII in 1906 … and his last one more than a half-century later. These performances are historically important in that this conductor was the one who gave the world premiere performance of Psalm XLVII back in 1906. Maestro Inghelbrecht would return to the score numerous times in the ensuing decades, culminating in a 1958 Schmitt memorial concert, plus a later 1964 concert the conductor gave a short time before his death. While both performances are a bit rough-hewn, they are well worth hearing. The 1958 performance was part of an O.R.T.F. memorial concert of Florent Schmitt’s music performed two months after his death, which also featured Régine Crespin as the soprano soloist. The full 90-minute concert, containing the Psaume and four other Schmitt works, is available from the archives of French Radio and Television, including as a high-res download. 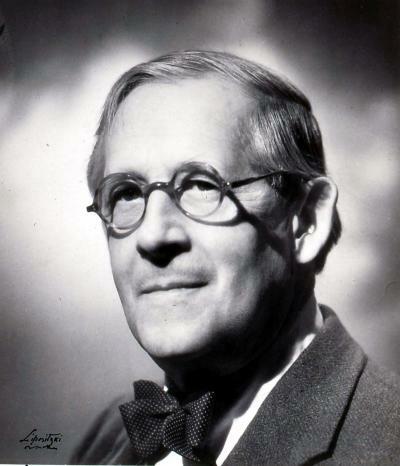 The later 1964 performance by Maestro Inghelbrecht is also available from the same source, including as a high-res download. Jean Martinon’s legendary EMI recording of Schmitt’s Psalm XLVII was preceded by a live performance that’s full of vigor and passion (1973). This was the public performance that preceded Jean Martinon’s celebrated recording of the Psalm, released by EMI and still considered a touchstone recording by many music lovers 40 years on. In the live performance, the huge pipe organ played by famed organist Gaston Litaize is missing, but the overall excitement level is incredibly high. As in the EMI recording, the live performance features the dazzling soprano soloist Andréa Guiot. 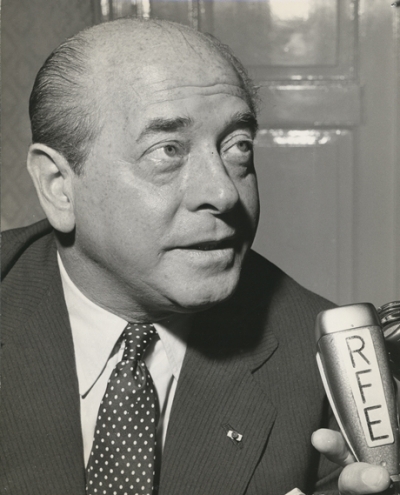 Eugene Ormandy conducted the Philadelphia premiere of Florent Schmitt’s Psaume XLVII in 1977. This concert performance, which also features soprano Kathryn Bouleyn, appears to have been very well-received by the audience — if the hearty applause heard at the end of the piece is any indication. This performance has proven to be rather elusive over the years, but is currently available for purchase through the Music in the Mail website (Disco Archivia #748). Those interested in investigating Maestro Ormandy’s approach to this work should definitely take action while the recording remains available. Jean Fournet’s 1992 live concert performance of Psaume 47 is available on the Japanese Fontec label (FOCD 9249) — a highly effective reading. 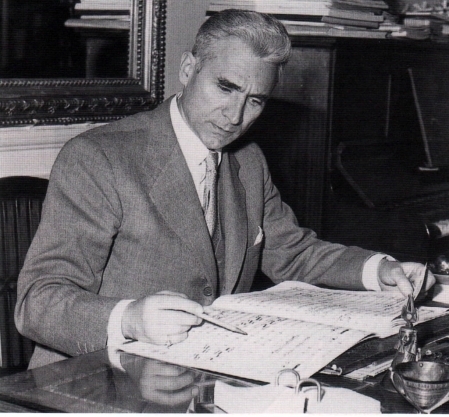 The French conductor Jean Fournet was the music director of this Japanese orchestra for many years, during which time he programmed much French music including Schmitt’s Psaume XLVII and La Tragédie de Salomé. This live concert performance of the Psalm, captured in 1992, has been issued commercially on Fontec, a Japanese CD label. I consider it the most successful of these six live performances based on a combination of the interpretation, musical precision, and sound quality. The CD recording is available for purchase from Fontec directly. 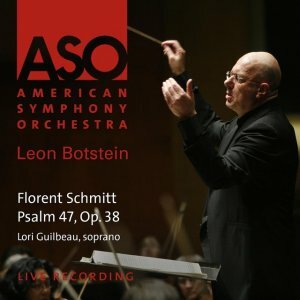 Leon Botstein’s 2012 performance at the Bard Music Festival was the second time he programmed Schmitt’s Psalm 47 with the American Symphony Orchestra. The most recent of the six performances is one that has been commercially available for about a year now. This performance is the swiftest interpretation of the Psalm I’ve ever heard. Perhaps as a result of this, there are a number of instances when the orchestra, chorus and soprano soloist aren’t quite in sync with one another, which will prove problematic for some listeners. Maestro Botstein first performed this work with the ASO back in 1997 – a concert I was privileged to attend. That time, he adopted the “conventional” tempo (which I find more effective — and utimately more successful). Still, it’s good to have this 2012 rendition so readily available through Amazon. 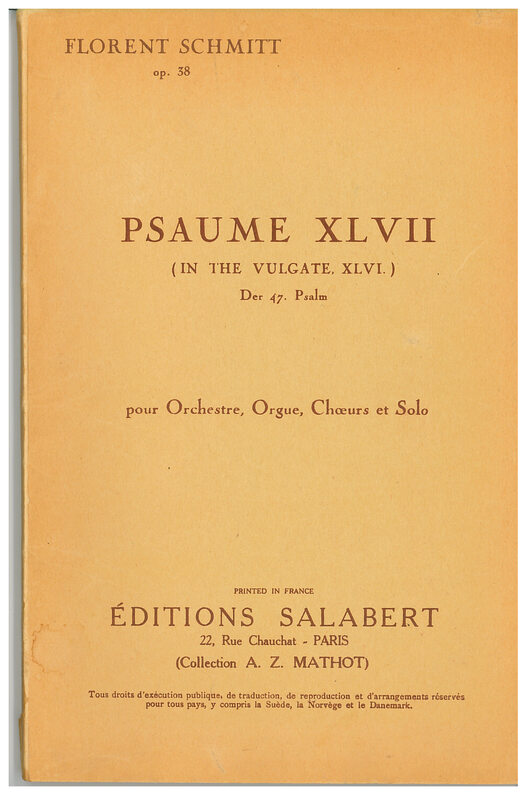 Without doubt, Psaume XLVII is one of the most exhilarating choral works in the musical literature. Hearing it in the “immediacy” of a live concert atmosphere makes the excitement even more palpable – which is why these six performances are so necessary to hear. Simply put, they’re glorious renditions. You’re missing out on something special if you don’t explore them. This entry was posted in Choral Music, Classical Music, Composers, French Composers and tagged Choral Music, Classical Music, Composers, Desire Inghelbrecht, Eugene Ormandy, Florent Schmitt, Fontec, French Composers, Jean Fournet, Jean Martinon, Leon Botstein, Psalm 47, Psalm XLVII, Psaume 47, Psaume XLVII, Schmitt. Bookmark the permalink. « Originality, Eclecticism … and Female Voices: Florent Schmitt’s Six Chœurs (1931). Given the paucity of Schmitt recordings generally, perhaps you could also list, in a separate subheading, studio recordings of this wonderful piece, by conductors Georges Tzipine, Marek Janowski, Yan-Pascal Tortelier and Thierry Fischer? That’s a good suggestion. Some of that information is covered in another post about Psalm 47 (https://florentschmitt.com/2012/11/12/psalm-xlvii-florent-schmitts-blockbuster-choral-masterpiece/), but it’s a good idea to prepare a full list the commercial recordings — similar to the article about the commercial recordings of La Tragédie de Salomé (https://florentschmitt.com/2013/09/07/la-tragedie-de-salome-florent-schmitts-most-famous-composition-15-commercial-recordings-and-counting/). I have listened to all of these remarkable performances and believe that they all have their merits. Martinon and Inghelbrecht both have a strong amount of authenticity with their French forces, although the sound is less than ideal for such a spacious work as the Psaume. Fournet and his Japanese forces really impress me with their power, even with the strange-sounding French (!). I was surprised by the power and vigor of the performance from Fournet. I have to say I was pretty underwhelmed by the Botstein ASO performance mentioned above, with lower tension and excitement than I expected — which surprised me since I had first heard this work in a performance at Lincoln Center in New York City in 1997 done by the same forces (except the soloist that year was Korliss Uecker). That one was far more effective. Thank you for these insightful observations. I agree with you about the 2012 Leon Botstein performance being less effective than the one he led at Lincoln Center in 1997. If you have heard it, would you care to comment on the Ormandy performance as well?